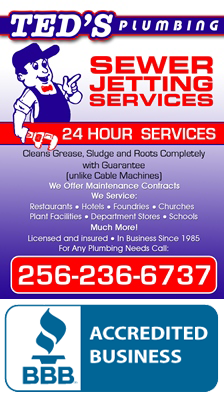 Are you looking for a reliable and honest plumbing contractor in the Alabama area? Since 1985, Ted’s Plumbing has been the go-to company for all plumbing installations and repairs. We also provide our customers with emergency services during the weekends. For your safety and convenience, our company is fully licensed and insured. Ted’s Plumbing is a member of the Better Business Bureau (BBB). We offer upfront pricing, free estimates and all of our work is warrantied. Please review our services for additional information. Contact us today to let us handle all of your plumbing needs!